Isolated and very well defined Lawsonite crystals, one of them clearly dominant, on a matrix crossed by a blue band of Glaucophane. 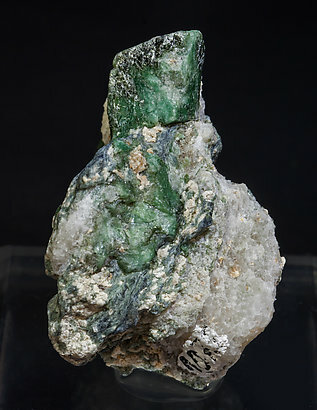 Lawsonite is a rare sorosilicate that has, in this case, an unusual green color due to it’s being a chromian variety. The sample is from the Carles Manresa collection whose label we will send to the buyer. An old sample from a very uncommon locality that we must not confuse with the type locality (Tiburon Peninsula). 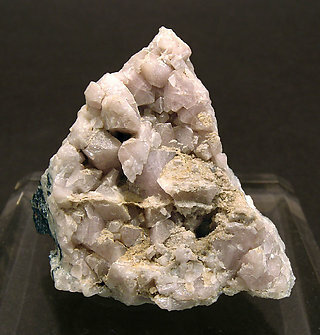 Pink crystals are well developed on a Glaucophane matrix. The sample was collected by Scott J. Williams (Scottsdale, Arizona) in 1948 and it was purchased from him by Folch in 1961.